Here’s how I met Shawn Kolodny. 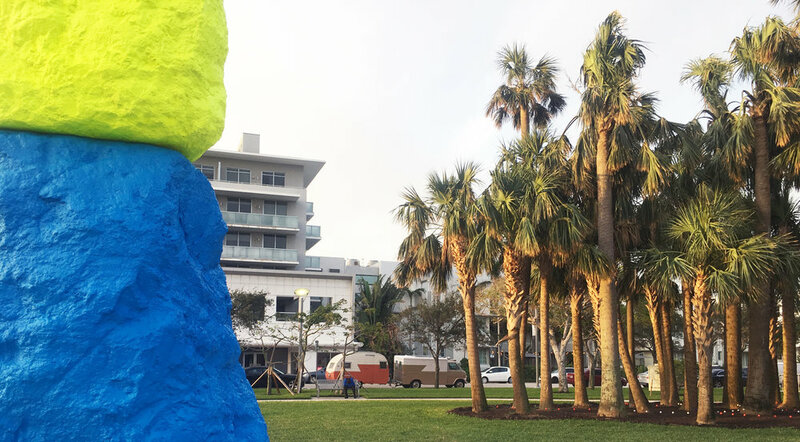 So I’m parked with the Mobile Incubator at Collins Park on Miami Beach, right next to the Bass Museum. And across the street is this curious storefront outside the Boulan Hotel… and in the window is a neon sign that says “Fake Fulfillment Center”. So I pop over to see what’s going on and behind rows and rows of prescription bottles the receptionist welcomes me and invites me to put on a lab coat. Hmmmm… then I walk down a long hallway. And there’s a enormous syringe, and I squirt it onto a blank canvas and the canvas flashes with color! Then I go in the next room and there’s a huge rock garden - you know those zen gardens - except instead of rocks it’s thousands of pills and you comb the pills with a rake. And around the corner I can climb inside a giant pill bottle! And I share his penchant for the business side of art, he and I both have a BFA and an MBA. Which unlocked a new level of thinking to our creations. Shawn’s a visual artist but he’s also been a partner in many nightclub ventures like Pink Elephant, Go, and many other clubs. In his art, Shawn draws from his life spent amongst substance, addiction and materialism, of which he says he’s “been both the observer and the subject”, and that “addiction is a pathological relationship in which things replace self”. Shawn talked about the difference between a job, a career, and a calling. For him, his early employment as bartender was just a job, but as part owner of that bar he had some skin in a real career. Now as an artist, he’s following his calling, to reveal the superficiality of drugs, brands and ego, through his art.